With little brand awareness outside of middle Tennessee, it appears Sommet has suddenly wised up to the fact that approximately eight million dollars may have circled the drain over the past two years, as part of their three year naming rights deal with the Nashville Arena. 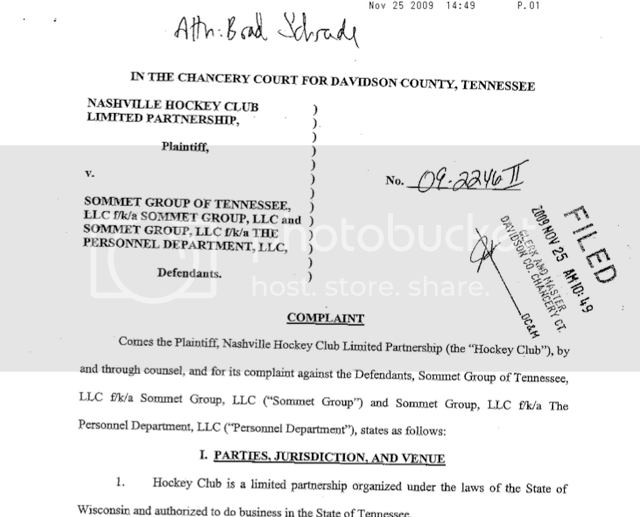 On November 25th the Preds thanked Sommet by suing the naming rights partner for missed payments on the deal scheduled to expire at the end of 2010. Here's the full filing. The lawsuit states that Sommet, a Tennessee-based collection of business to business companies, stopped issuing payments for its naming rights sponsorship (rumored to be worth $4 mil/yr) in August. "Nobody likes to sue their naming rights partner," said Derek Perez, the team's executive vice president for marketing told the Tennessean. "This is a nuisance, not a problem...For Predators fans, it's business as usual." But according to Sommet, the Predators have been doing business with competitors on the side. "The reason we have withheld payments is because our supposed partner in naming rights is not acting like one," Sommet Managing Partner, Brian Whitfield, said in a statement. "We entered into the agreement with the understanding that in partial exchange for our payments, our business units would be the preferred provider of certain products and services." Given Sommet is primarily a business to business company, it seems logical that use of services would be one of the key parts of the deal, rather than consumer name awareness. It also seems logical that Sommet may have wasted a lot of money paying for consumer impressions over the past two years. Not a great track record here for the Predators. Less than five years ago, Gaylord Entertainment Company and the Predators settled a legal disagreement surrounding their $80 million/20 year naming rights to the arena. The Tennessean reports that "the final straw" came when the Predators' decided to purchase promotional T-shirts to be handed out at a game from an out-of-state vendor, rather than Sommet. Meanwhile, city officials are making it clear that they won't be left holding the bag on the arena. "They need to get busy and find someone else to put the name on the building, because the taxpayers can't give any more," City Councilman Michael Craddock said. There must be more to this story right? If you know, tell us.